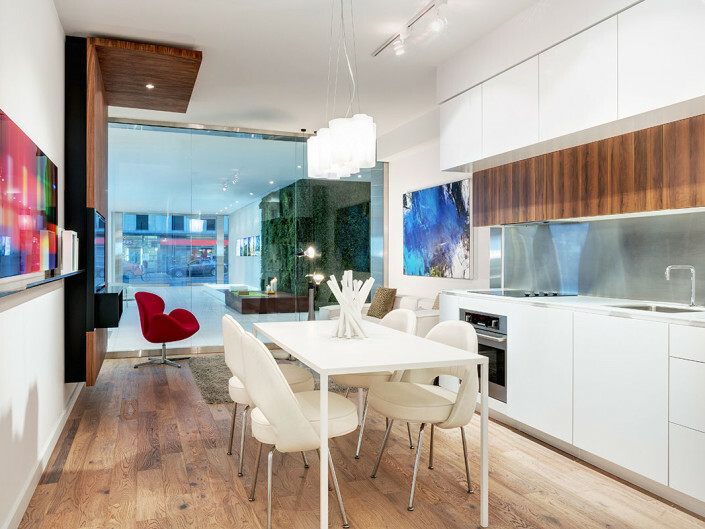 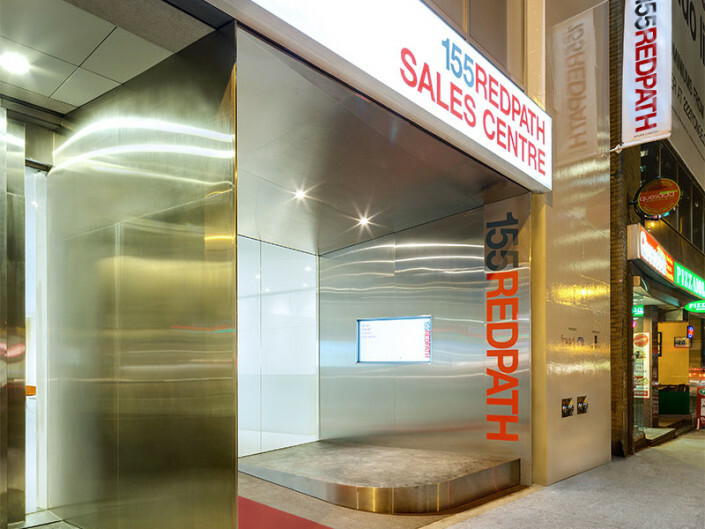 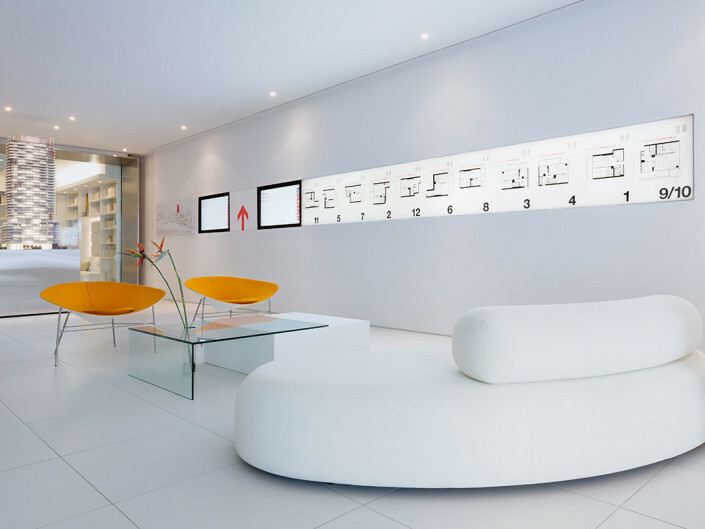 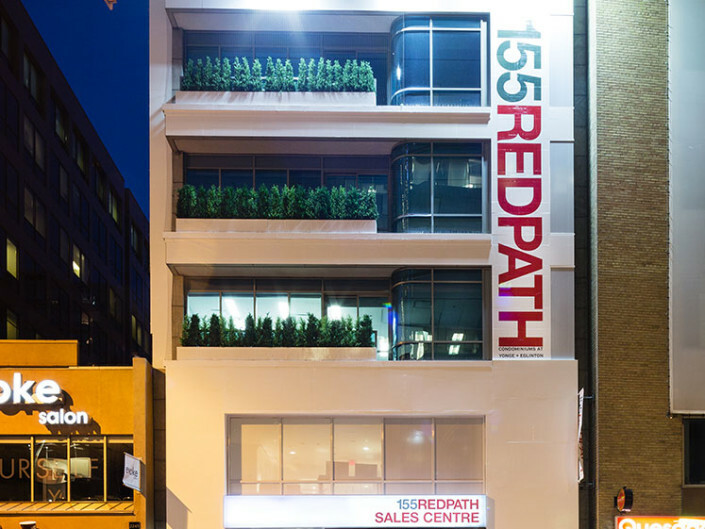 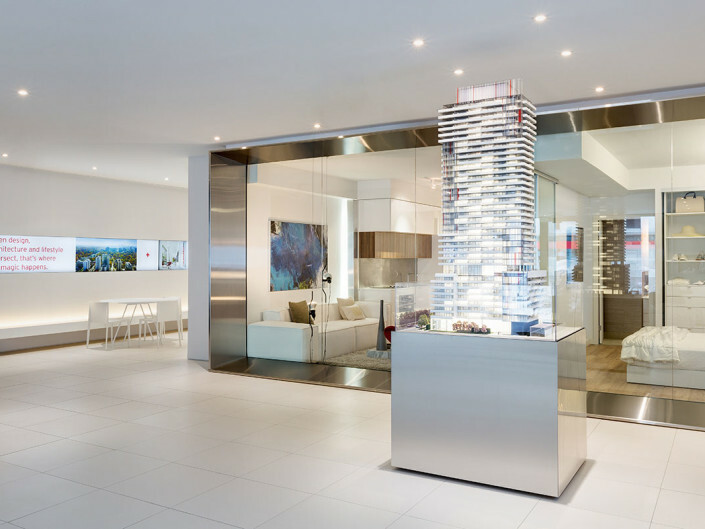 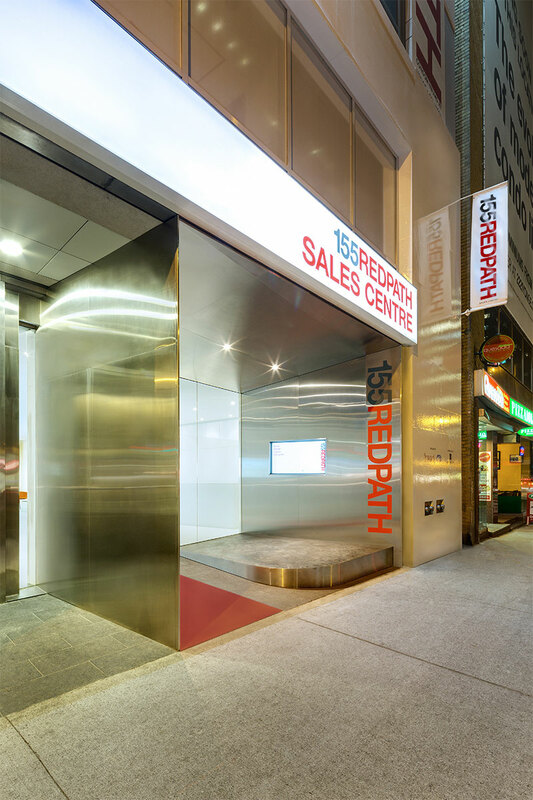 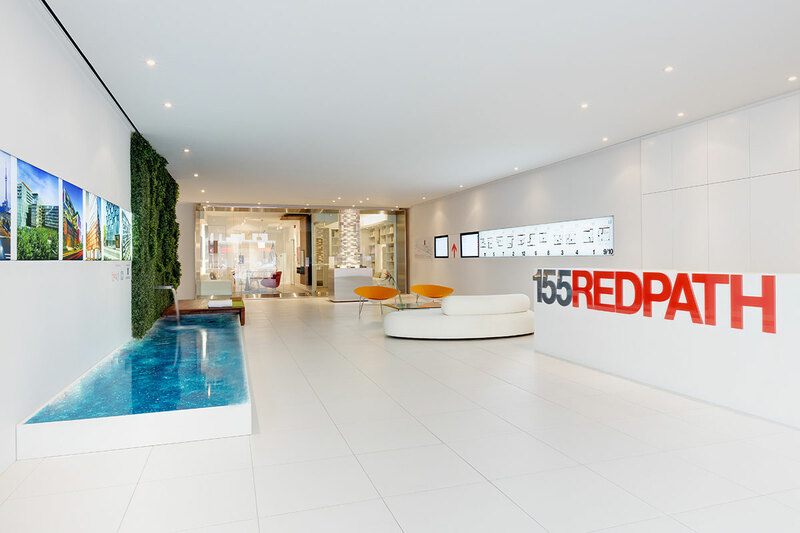 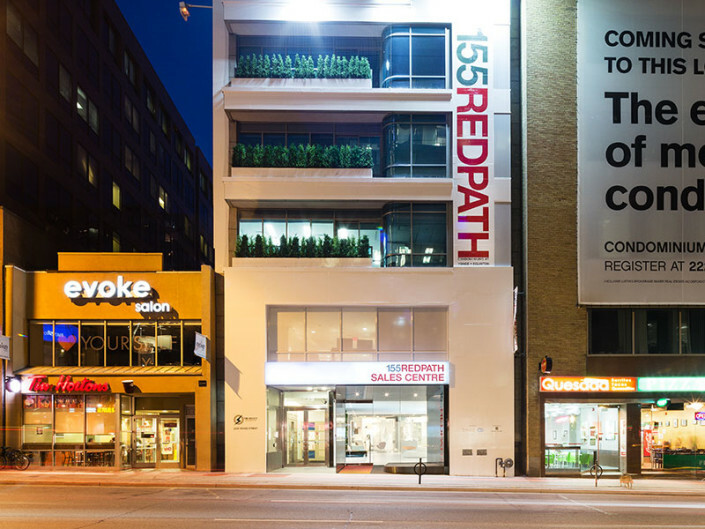 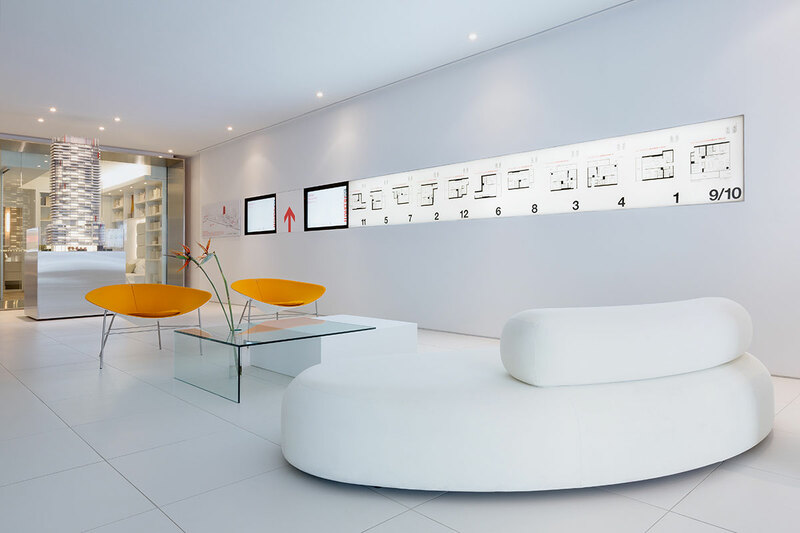 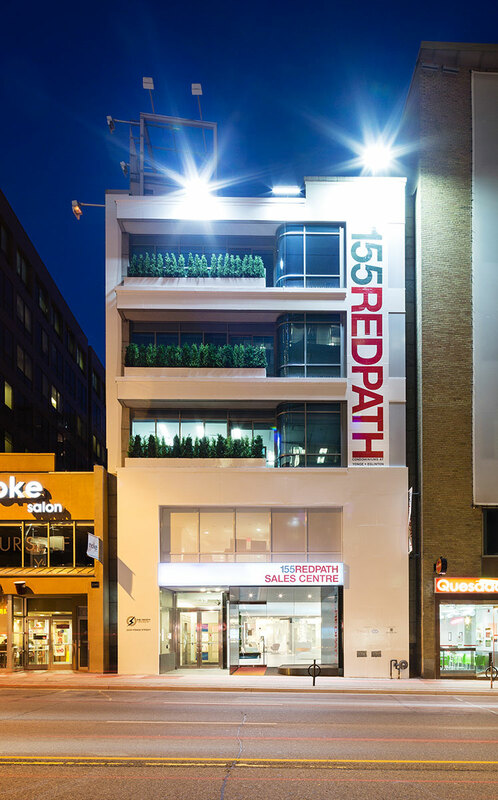 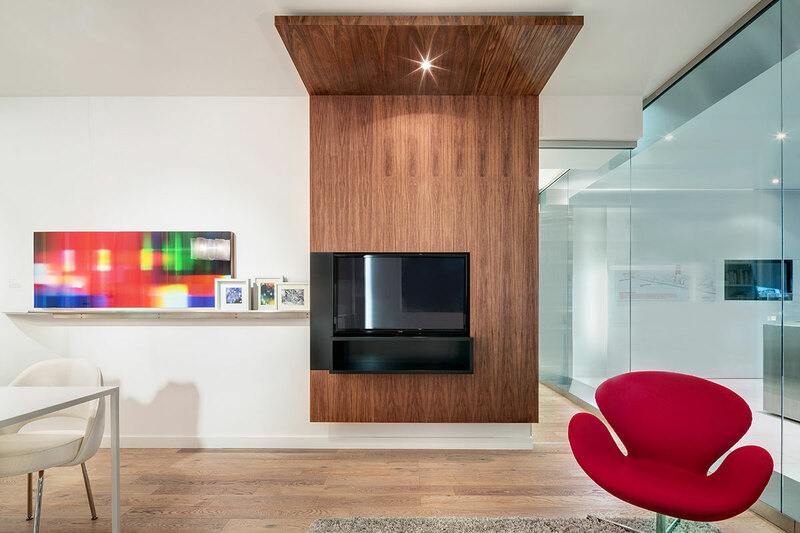 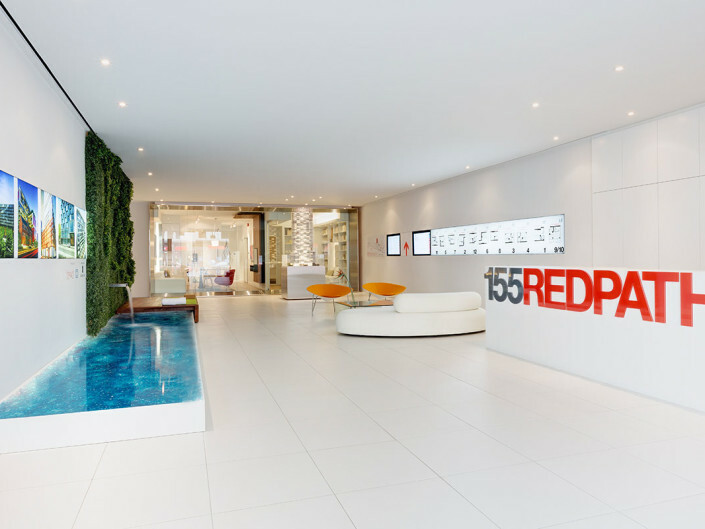 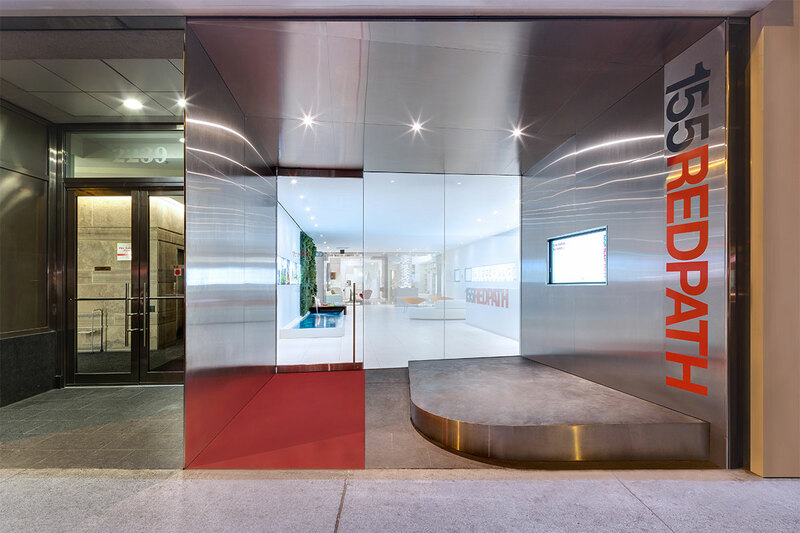 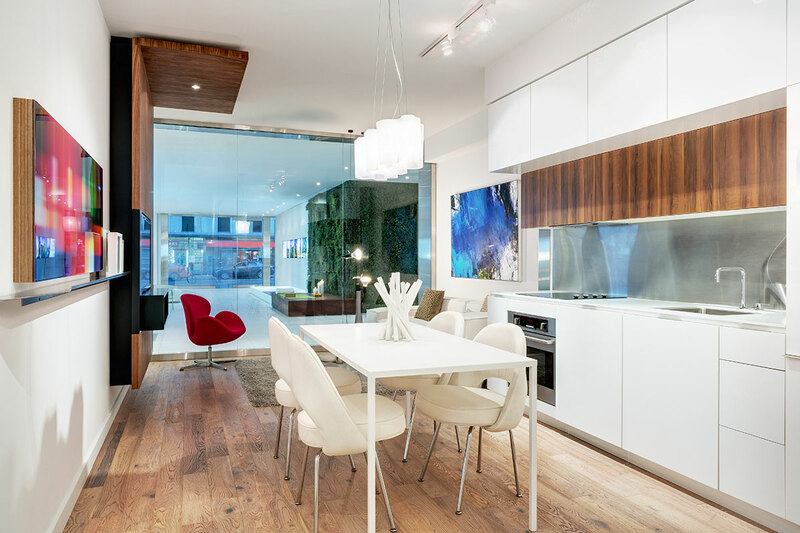 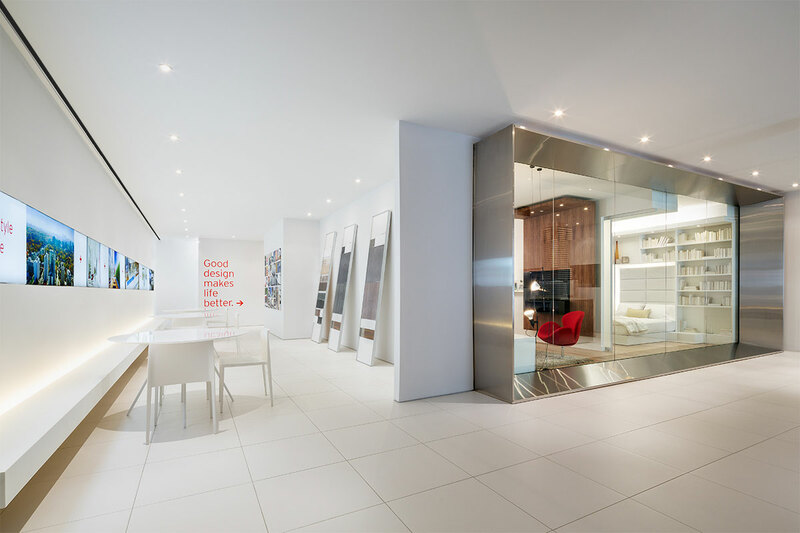 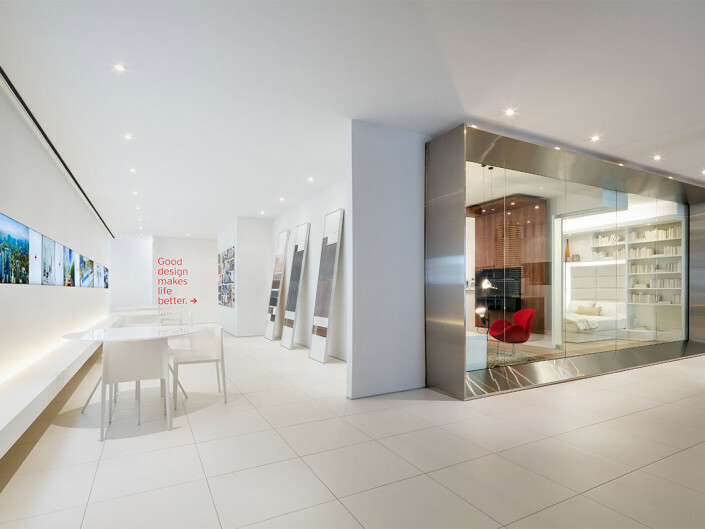 Inspired by the existing residential neighbourhood and the distinct architectural and landscape design features of the future condominium development, the 155 Redpath sales centre itself is intended to invoke and amplify those unique characteristics. 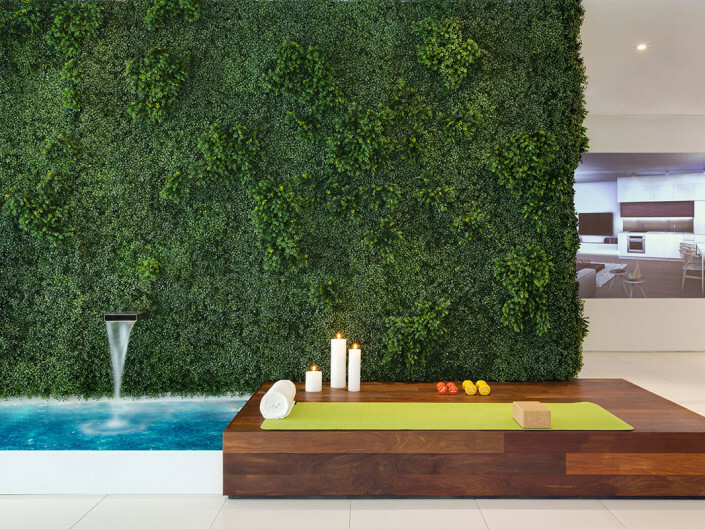 With the bulk of the proposed condominium building lifted from the ground floor, the interior public spaces offer uniquely clear vistas of the rich and carefully landscaped amenities – an urban oasis – a retreat composed of spaces imbued with beauty, simplicity, tranquility and enchantment. 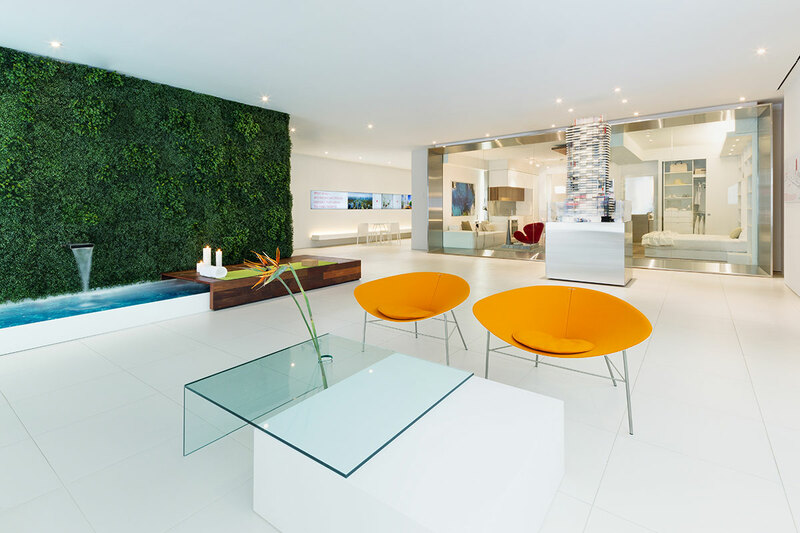 Similarly, the sales centre recreates the notion of an urban oasis by utilizing a design strategy that includes the framing of exterior views from within, creating spaces of spa-like calm, reducing architecture to its essence (form, light and space), and introducing design features that encourage interaction with natural elements. 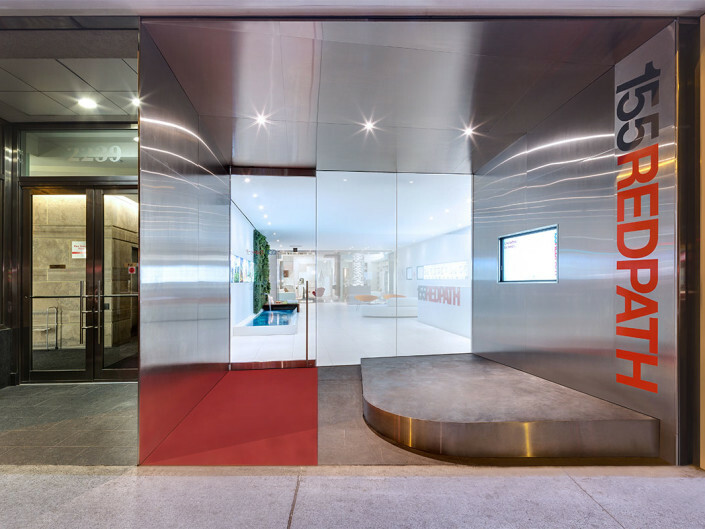 The existing building, with its exterior newly sheathed with white fabric, concentrates one’s view towards the ground floor entrance and through a series of stainless steel frames; the exterior frame functions as an entrance tunnel and another one further into the interior focuses the view of the model suite. 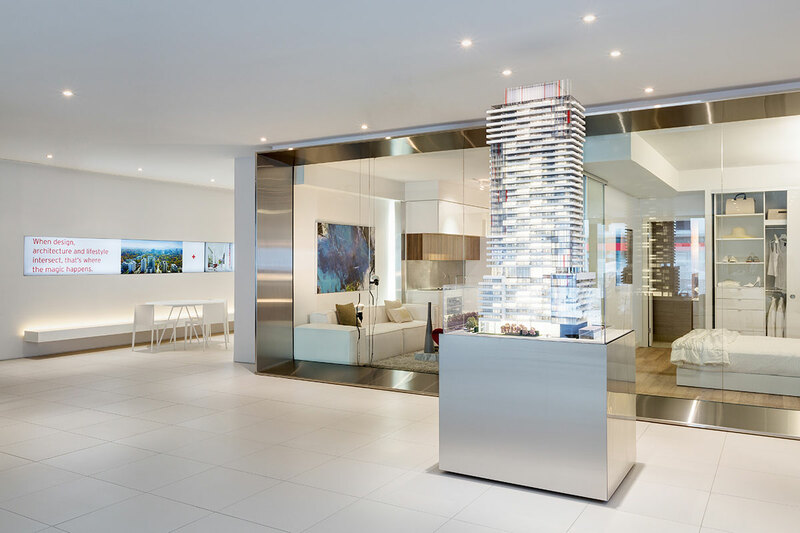 Appearing as an elemental, glowing, interior space, the sales centre features a reflecting pool and fountain – providing soothing ambient sounds disguising exterior traffic noises. 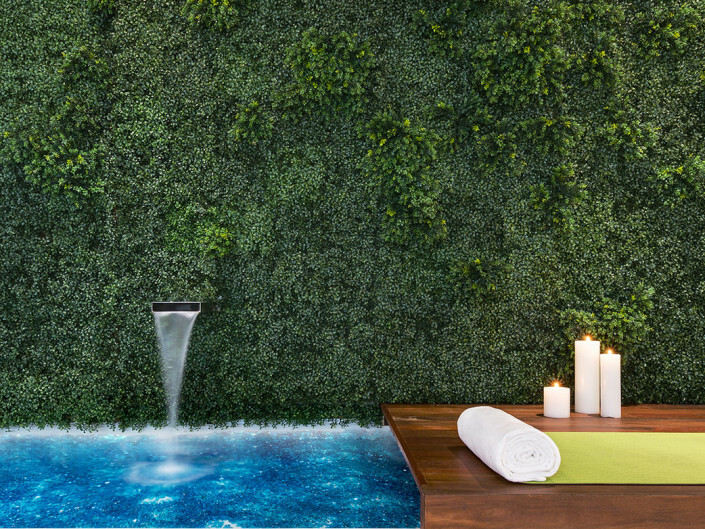 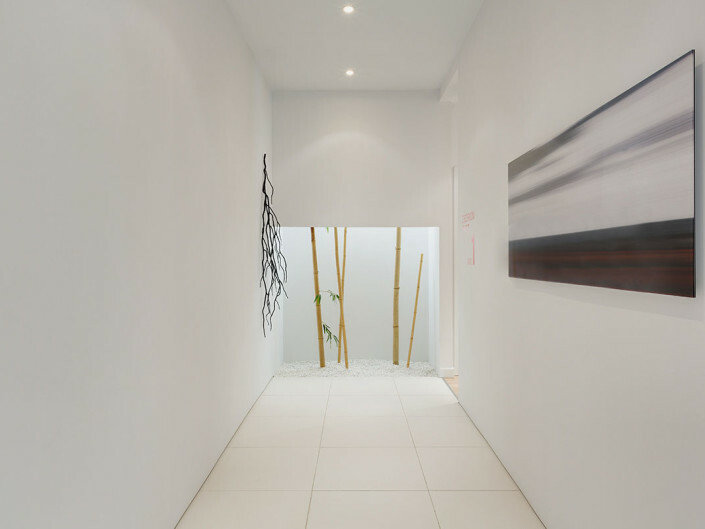 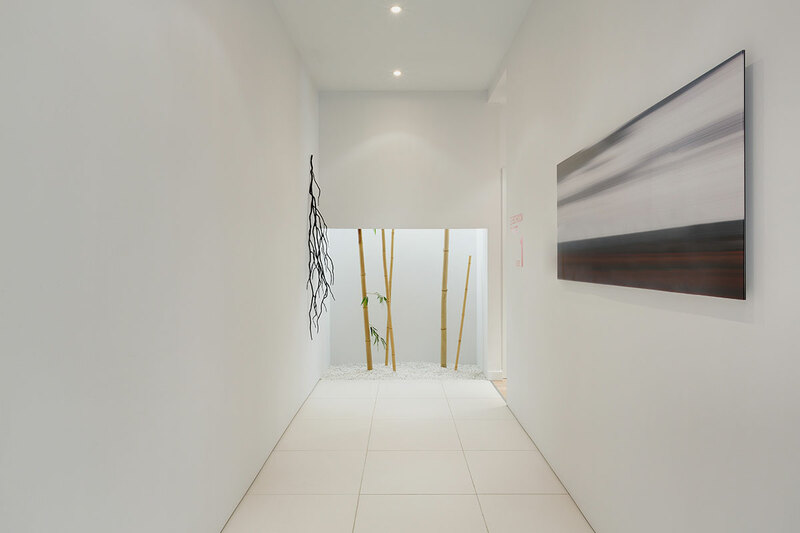 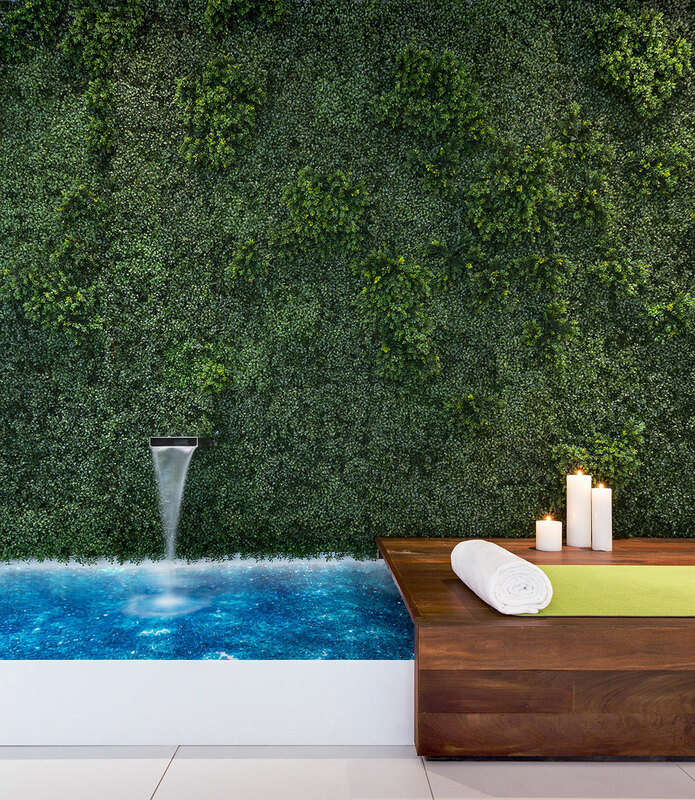 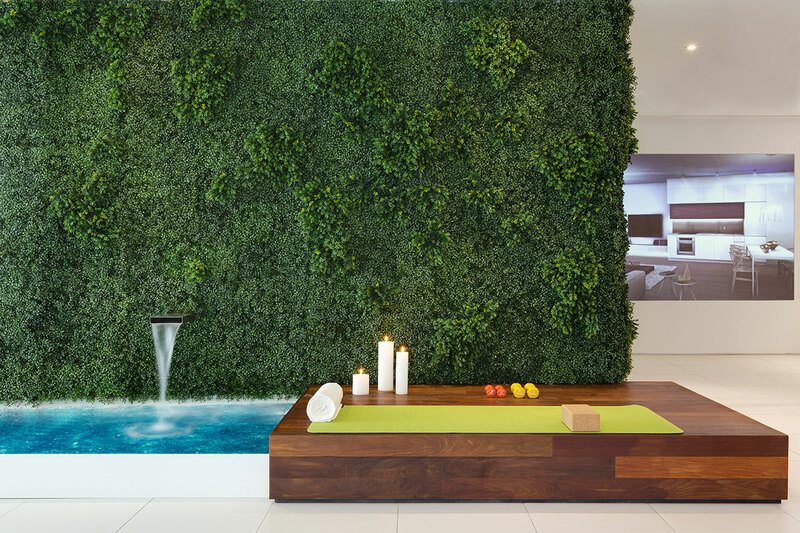 Paired with a wall of simulated vegetation, they are intended to suggest elements of the future condominium’s landscaping and engender a spa-like atmosphere. 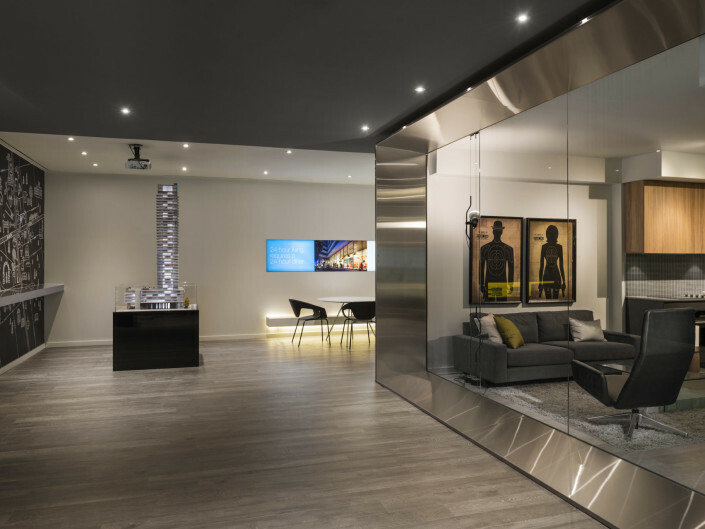 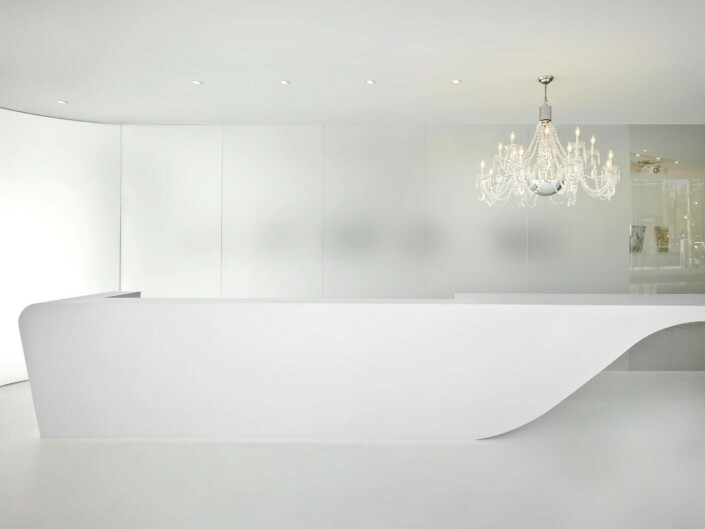 Movement through the space is carefully orchestrated, commencing from the reception desk and pool area, to a lounge anchored by the architectural model, to an intimate closing area with material sample boards, and concluding with a gentle ramp leading to the model suite. 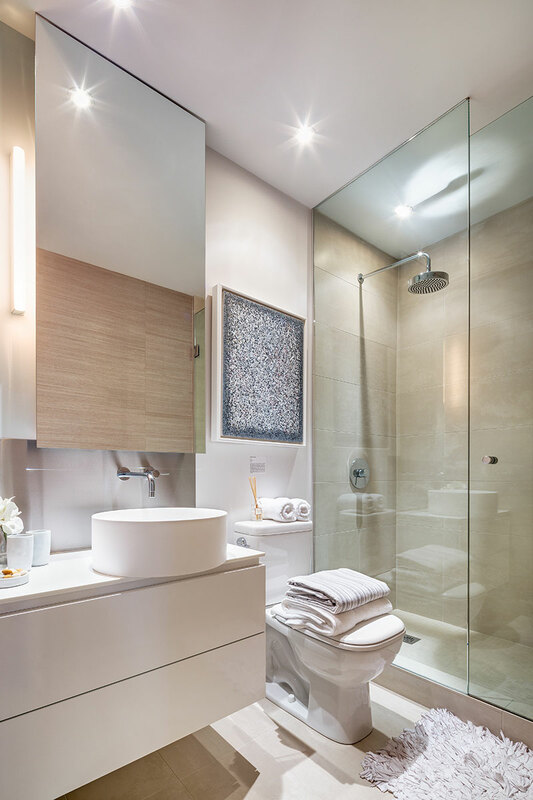 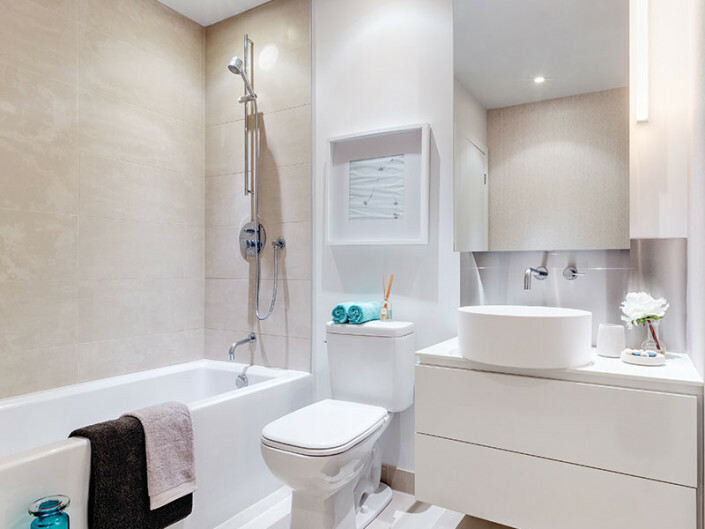 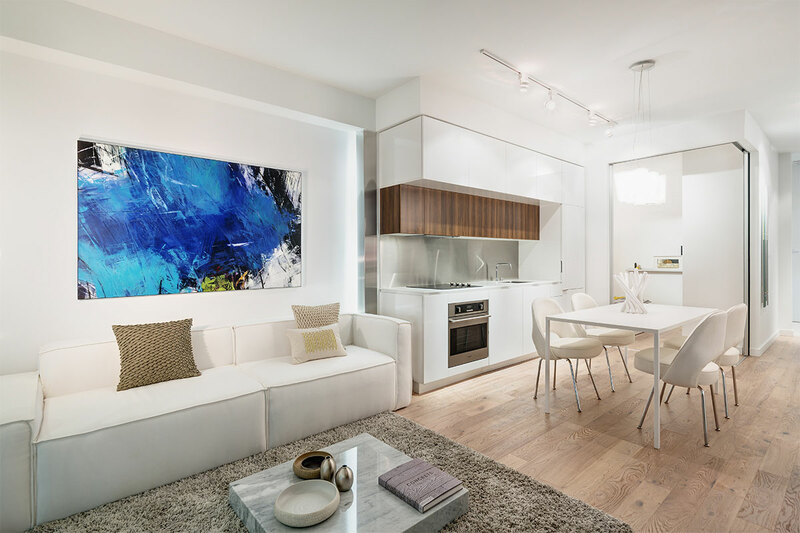 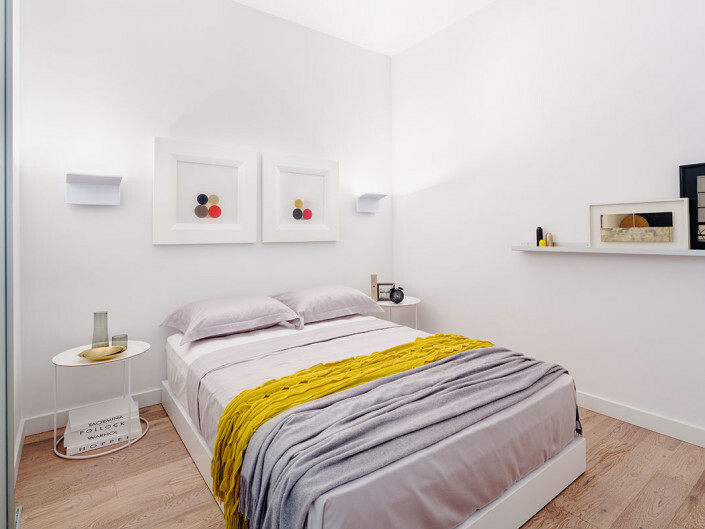 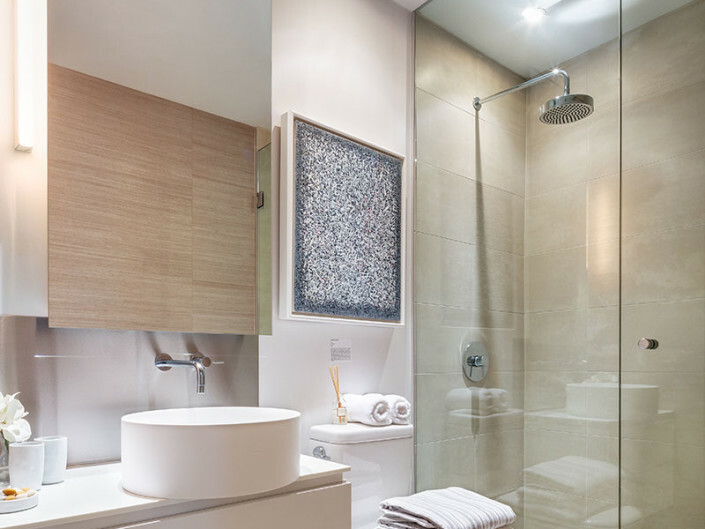 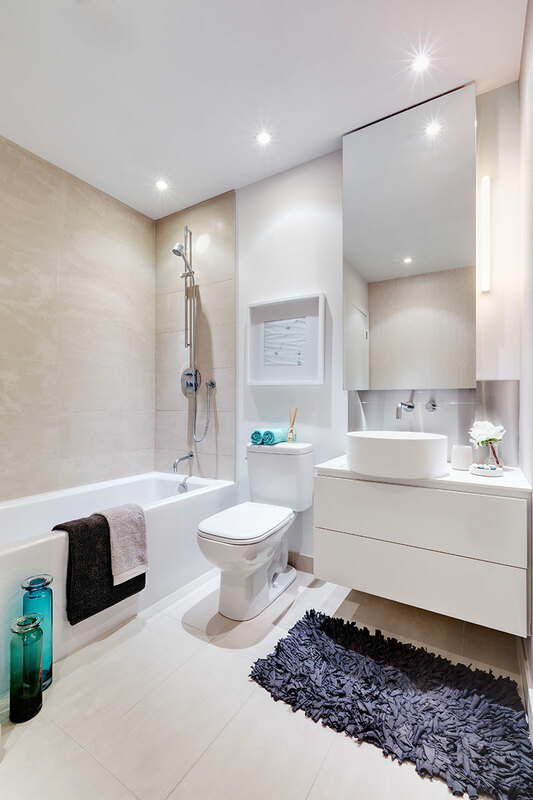 The model suite, comprised of two bedrooms, living/dining rooms, kitchen and two bathrooms, was conceived to parallel the notions of an urban retreat and to inspire the potential within compact urban spaces. 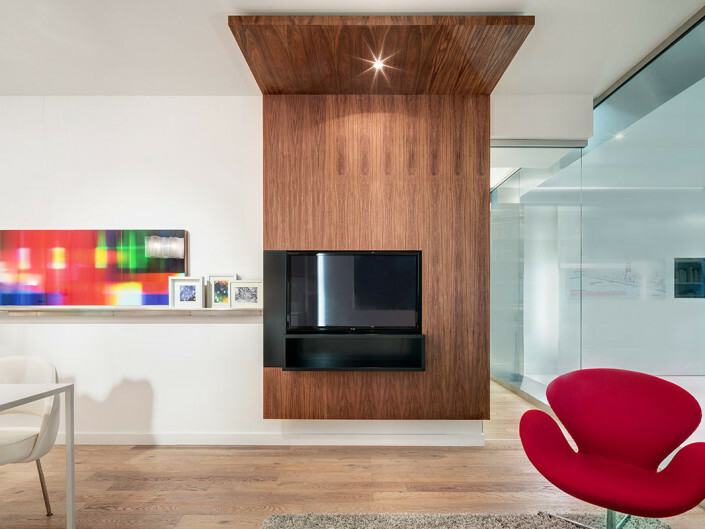 The suite features a custom-designed TV/storage cabinet, an expansive bookshelf/display and an integral bed unit in the master bedroom.